Is Erdoğan creating a powerful presidential system that will be used against him and his party? ISR comment: The Turkish president, Recep Tayyip Erdoğan, may get his wish and transform the Turkish parliamentarian governing system into a presidential system. His campaign to do so was not motivated by the virtues of the presidential system more than by personal ambitions. He has been the most powerful and consequential president since the founding years of the republic. He has been acting as the executive president without the constitutional authority already. His problem is that, there is a good chance that he may never serve as the first legitimate executive president. In fact, it is possible that an opponent could be elected under and amended constitution, not Erdoğan, and with the consolidated power Erdoğan has built for himself, the new president could end up throwing Erdoğan in prison for many of the unconstitutional and illegal acts he carried inside and outside Turkey. That would be an example of the Islamic proverb: whoever digs a trap-hole for his brother is bound to fall in it himself. Erdoğan has made many fatal mistakes in the past five years and he is making even more in recent months. He created enemies out of old friends and and never reconciled with old enemies. He is fighting with the U.S. against ISIL, but fighting with ISIL against Iraqi government. He is with the U.S. in its campaign to overthrow Assad but against it in its support for the Syrian Kurds. He made friends with Russian president, Putin, but he continued to antagonize Russia's allies, Iran and Iraq. His is friends with Iraqi Kurds, but considers Turkish Kurdis terrorists. His circle of friends is shrinking and his front of enemies is swelling. All these foreign affairs problems are putting the Turkish economy under extreme stress. His party was accepted by Turkish voters because of the prosperity and peace it brought them. If peace and prosperity are threatened, Turkish voters will vote him and his party out. But he and his party would leave behind a very powerful presidential institution, should it fall in the hands of his adversaries, his legacy would be reduced to a catalog of failures. Strangely, Erdoğan could be creating his dream job for someone else. The ruling Justice and Development Party (AKP) has finalized preparations for a draft of a constitutional amendment, which will change the country’s parliamentary system to an executive presidency, Prime Minister Binali Yıldırım said on Oct. 23. “We have finalized our work on both the new constitution and on the presidential [system]. We have made sufficient discussions both in parliament and by the public. We’ll bring our proposal to parliament as soon as possible,” Yıldırım said addressing the deputies in his closing speech at the AKP camp. The government will go to a popular referendum on whether the parliament should adopt new charter draft with 367 votes or agrees to go for public opinion on 330 votes, he said. So that Turkey will end “system debate and use its energy for its future,” Yıldırım said. After the consultation camp in Afyon, the charter will be introduced to two of the opposition parties in parliament, the Republican People’s Party (CHP) and the Nationalist Movement Party (MHP), as the AKP has refused to work with the third largest party in parliament, the Peoples’ Democratic Party (HDP). 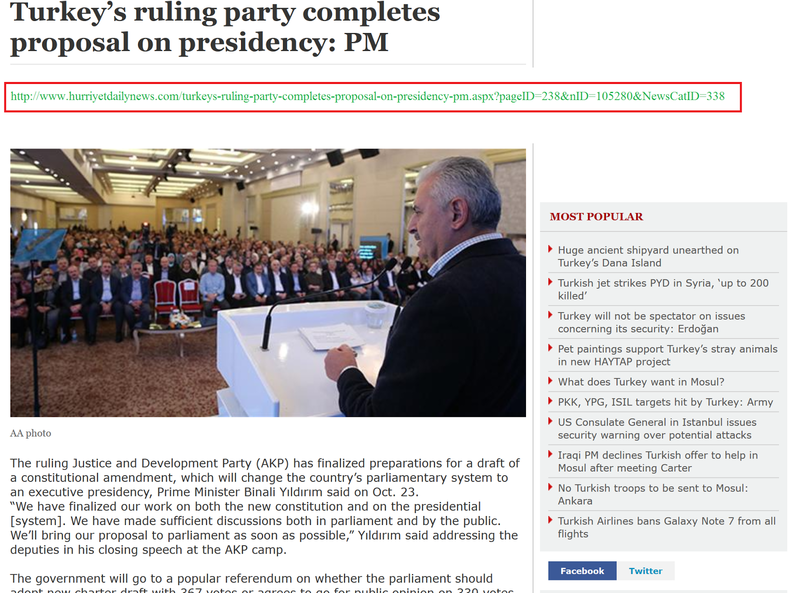 After the bilateral discussions with the two opposition parties, AKP will submit the draft to parliament. The AKP officials have indicated that the party anticipates a referendum on the draft in April following an approval in parliament set to be done in January. The draft will include 12 to 15 articles outlining the presidential model that the party will present to the public. Constitutional change, in particular, the call for a presidential system, has been on the political agenda since President Erdoğan, the former prime minister, was elected as Turkey’s president in August 2014. The 2014 election was the first time a Turkish president, whose role is officially defined as symbolic, was directly chosen by popular vote. The discussion on the presidential system was revived after Bahçeli suggested going to a referendum, to let the people decide if Turkey should change its administrative model. Changing to a presidential system is opposed by Turkey’s two other parliamentary parties, CHP and HDP, and the AKP lacks the super-majority in parliament needed to make the change without submitting it to a referendum.